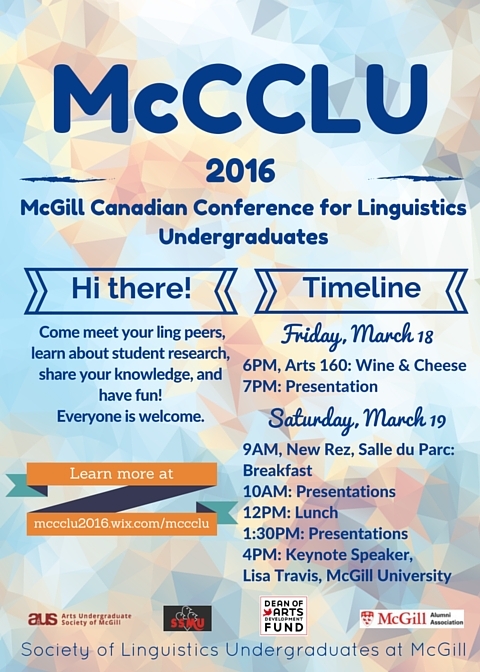 The Society of Linguistics Undergraduates at McGill is proud to announce the 10th edition of McCCLU, the McGill Canadian Conference for Linguistics Undergraduates. This year McCCLU will run on March 18-19 and will include a Wine & Cheese event in Arts 160 (Arts Building) on the 18thand a full day of presentations on the 19th at New Rez, 3625 Parc. We are hosting speakers from several universities in Canada and the US, our very own Hannah Cohen and Douglas Gordon, and Professor Lisa Travis of McGill as a keynote speaker. We hope to see you at McCCLU! Published by McLing on March 14, 2016 at 1:50 am under Conferences, Events, Undergraduate news.